Artist's concept of China's Chang'e 5 lunar sample-return mission, which the nation aims to launch in November 2017. China is working to launch a sample-return mission to the moon before the end of 2017. The mission, known as Chang'e 5, will be the first to bring lunar material to Earth since the Soviet Union's Luna 24 spacecraft did so in 1976. According to Chinese news services, the over-8-ton Chang'e 5 is comprised of four parts: an orbiter, a lander, an ascender and a "returner" (an Earth re-entry module). The mission will be China's first automated moon surface sampling probe. After touching down, the lander will place lunar samples into a vessel in the ascender. 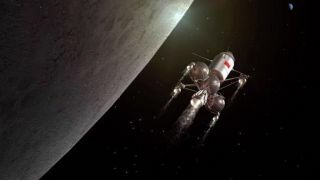 Then the ascender will take off from the lunar surface to dock with the orbiter and the returner, which will be circling the moon together, and transfer the samples to the returner. The orbiter and returner will then head back to Earth. The two craft will separate from each other far from Earth, with the returner module eventually re-entering and parachuting down to the planet's surface solo. If successful, the Chang'e 5 mission would be the first lunar sample return to Earth in more than 40 years. The former Soviet Union successfully executed three robotic sample-return missions in the 1970s: Luna 16 returned a small sample (101 grams, or 3.6 oz.) from Mare Fecunditatis in September of 1970; in February 1972, Luna 20 returned 55 grams (1.9 oz.) of soil from the Apollonius highlands region; and Luna 24 retrieved 170.1 grams (6 oz.) of lunar samples from the moon's Mare Crisium (Sea of Crisis) for return to Earth in August 1976. And NASA's Apollo astronauts brought more than 800 lbs. (360 kilograms) of lunar material to Earth over the course of six landed moon missions from 1969 to 1972. China plans to fulfill three strategic steps with the launch of Chang'e 5: "orbiting, landing and returning." The first spacecraft of China's ambitious moon program, the Chang'e 1 lunar orbiter, was launched in 2007, and Chang'e 2 followed in 2010. Chang'e 3, which included a lander and a rover, was launched in December 2013 and successfully landed softly on the moon. Also on the country's moon exploration schedule is the launch of the Chang'e 4 lunar probe around 2018. Chang'e 4 is designed to make the first-ever soft landing on the far side of the moon. (The mission was originally scheduled to launch in 2015 but was delayed, in case you were wondering why it's lifting off after Chang'e 5.) China also plans to launch a robotic probe to a gravitationally stable location beyond the lunar far side known as the Earth-moon Lagrange Point 2, to relay communications from Chang'e 4 back to Earth, according to the China National Space Administration (CNSA). "The country plans to send robots to explore both lunar poles," CNSA vice director Wu Yanhua said late last year, adding that plans to send astronauts to the moon were also being discussed, Xinhua reported. Also last year, Tian Yulong, chief engineer of the State Administration of Science, Technology and Industry for National Defense (SASTIND), noted that "lunar exploration is endless." Tian said that China is in discussion with the European Space Agency and other countries "to build bases and carry out scientific investigations on the moon, which will lay a technology and material foundation for human beings' landing on the moon in the future." Leonard David is author of "Mars: Our Future on the Red Planet," published in October by National Geographic. The book is a companion to the National Geographic Channel six-part series, Mars. A longtime writer for Space.com, David has been reporting on the space industry for more than five decades. Follow us @Spacedotcom, Facebook or Google+. Published on Space.com.